The crystal structure of vermiculite has over the years been investigated by many authors. The basic structure of the mineral is identical to the micas and to talc: a 2:1 silicate sheet composed of two flat layers of silica and alumina tetrahedra (the tetrahedral layers), which are joined together in a layer composed of apical oxygen atoms, and magnesium, iron, and hydroxyl molecules (the octahedral layer). Between the 2:1 sheets lies the ion exchangeable layer. This layer will change in thickness depending on the interlayer cation present and the arrangement of waters of hydration associated with it. The basal d-spacing of vermiculite are obtained by using X-ray diffraction will vary according to the composition of the ion exchangeable layer. The arrangement of hydrated magnesium ions in 14 Ao vermiculite was detailed by Mathieson and Walker (1954). Other common basal d-spacings occur at 12 Ao (i.e., barium, sodium, and strontium vermiculites), and 10 Ao (i.e., potassium and ammonium vermiculites). The hydrated interlayer cations are easily subject to ion exchange. 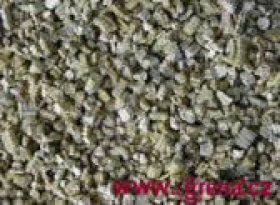 Typical ion exchange values for beneficiated vermiculite ores vary from 50 to 180 milliequivalents/100 gram. The interlayer of water is an essential component in the vermiculite. When a particle of vermiculite is rapidly heated, the interlayer crystalline water transforms into steam. The pressure of this steam evolution, forces the silicate layers to apart from one another and the vermiculite flake forms an elongate concertina like particle twenty to thirty times its original thickness. This is why the name vermiculite from the Latin vermicularis (worm-like) has been used for this group of minerals.